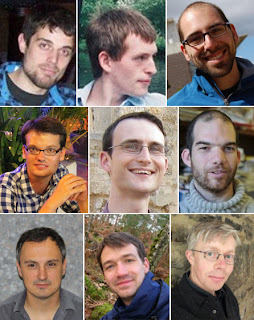 Authors of the paper in Physical Review Letters (reference  ). (bottom row) K. J. Weatherill, M. P. A. Jones, C. S. Adams. Joint Quantum Centre (JQC) Durham-Newcastle, Department of Physics, Durham University, UK. Quantum communication and information processing rely on robust carriers of quantum information (qubits), and optical photons are prime candidates. Light can easily be transmitted using optical technologies such as fibre cables, and barely interact with other photons or the environment. To process the information they carry however, controllable interactions between the single photons are needed. Physicists at Durham University in the UK have combined two advanced techniques of quantum optics with a microwave synthesiser, to control the interactions between individual photons [1,2]. The photons were stored in a cloud of rubidium atoms as so-called Rydberg polaritons. Due to long-ranged interactions between them, only a single photon may be stored in a volume of a few micrometres, limiting the number of stored photons to about three. The microwaves manipulated the photons while they were stored, forcing them to interact in ways whose details are still not fully understood. 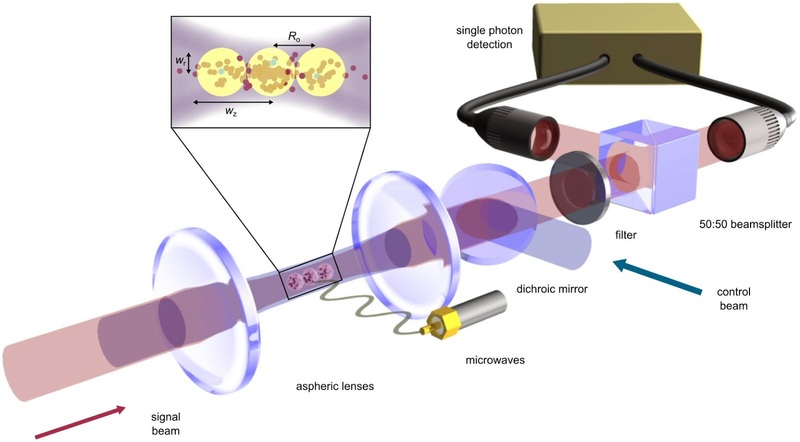 The ability to not only induce interactions on the level of single optical photons, but also to control them using microwave fields, could be an important new angle for future quantum technologies. A beam of light is one of the least substantial things you'll ever encounter. It is the very essence of something fast and untrappable - so much so that Einstein invented relativity specifically because he couldn't imagine what light would be like if it was stationary. And although light reflects off mirrors and scatters off other objects, we never consider that two light beams could bounce off each other. However, in specially tuned systems physicists can not only stop light, but make light interact with light. Our work achieves both these effects, making the interaction work at the single-photon level and even controlling it with microwaves. The loophole that allows us to do these things is that light isn't always the pure electromagnetic wave that it is in vacuum. When light travels through matter, like glass or water, the electric field of the light slightly distorts the atoms in the matter, and they tug back on the light. This slows the light down (to half-speed or slower), and is ultimately responsible for lenses, optical fibres, rainbows and other phenomena. Almost always, matter responds linearly to light so that the distortion from one beam does not affect another. At very high intensities, nonlinear effects can appear that do allow light to affect light. However, the dependence is so weak that it only manifests at very high powers. We care about the quantum nature of light, which only becomes apparent at the level of single photons. Photons carry a tiny amount of energy: a normal red laser pointer (emitting 1mW of power) produces over 3 million billion photons every second. Hence photons almost never interact. To slow photons to a crawl, bring them to a full stop and make them interact, we therefore need to deliberately engineer our own medium. We start from an extremely thin and cold gas of the element rubidium (it’s normally a solid metal) created by laser cooling and trapping techniques . The gas is about a million times more dilute than normal air (number of atoms per unit volume), so the experiment is done in a vacuum chamber. The gas needs to be extremely cold, just 100 μK (a ten-thousandth of a degree above absolute zero), because if the gas atoms move too fast they’ll mix up the light they’re storing. 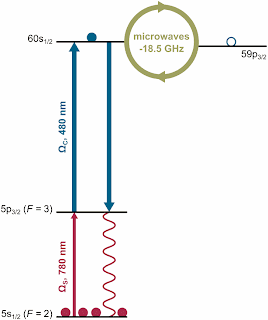 Figure 1: Relevant energy levels of rubidium, showing the 780 nm (red, signal) and 480 nm (blue, control) spectral lines, and the Rydberg-Rydberg microwaves. Gases like rubidium are useful because they have strong resonance lines – specific frequencies of light they interact with strongly and correspond to transitions between the discrete energy levels of the atom. We use two lines in rubidium, of wavelength 780 nm (less than a thousandth of a millimetre, a dim red colour) and 480 nm (bright blue). The red light is the signal we store – it excites normal, ground-state atoms to a particular excited energy level. The blue light takes atoms from that excited state to an even higher level called a Rydberg state. It affects how the rubidium atoms respond to the red light, not only preventing them from scattering the signal, but also slowing it down greatly because it is mixed so strongly with atomic distortion. If we turn the blue light off while signal is travelling through the cloud, the red photons are stopped and transformed completely into atomic distortion: a specific pattern of Rydberg excitations called a polariton. Unlike photons, Rydberg states do interact with each other extremely strongly, causing shifts in the resonance frequencies needed to excite nearby atoms to Rydberg states. As a single Rydberg excitation shifts the remaining atoms out of resonance with our blue light, a blockade effect occurs preventing multiple Rydberg excitations within a volume of a few micrometres. If photons are mixed with Rydberg states, like in our cloud, the photons gain this ability to interact strongly and the blockade applies to them, imposing a minimum separation between photons. Photons that are too close together are scattered out of the cloud. If the cloud is dense enough, this leads to a continuous laser beam being filtered into a series of individual photons, as demonstrated recently by a group at MIT . Alternatively we can stop light in the cloud, and allow the blockade to work while the photons are stored – this was done not only in our experiment, but also by a group at Georgia Tech where a single photon source was implemented . Reliable single-photon sources like this are important for many other quantum experiments, as well as for quantum cryptography . Our cloud is large enough for about three polaritons to sit in a line, each containing a single photon shared among many atoms. Due to the blockade, they are separated by a distance called the blockade radius, which measures the strength of interaction between two Rydberg atoms. This interaction is called the Van der Waals interaction, and it’s the same force that sticks molecules to each other in most solids around you. Once we have some photons stored, our next step is to beam microwaves at the cloud, tuned to a transition between two different Rydberg states. One of these is the state we stored a photon in (called “S”), and the other state was previously empty (called “P”). Our blue light is only tuned to interact with the S state, not the P, so it will only release a stored photon if the polariton is in S. In an isolated Rydberg polariton, this would drive regular sine-wave “Rabi” oscillations between the two states. So if we apply microwaves for just long enough to transfer to P, and then turn the blue beam on, we don’t retrieve the photon. Figure 2: Diagram of the experiment, showing the cloud of atoms with three stored polaritons. The two single-photon detectors shown are used to prove that the number of stored photons is limited, via a Hanbury Brown & Twiss experiment [7.8]. Instead of a single polariton, we’re most interested in what happens when the polaritons aren’t isolated, but have neighbours to interact with. The microwaves make them oscillate at the same rate. For a start, photons are only retrieved from the cloud when all polaritons are in S. This leads to the Rabi oscillations (shown in Figure 3) having flattened bottoms and sharper peaks when we scan the microwaves, and the exact shape helps us estimate the number of polaritons we have. Also, while the polaritons are half-way between S and P, they have large electric dipole moments – (the static electricity equivalent of a tiny bar magnet). The original van der Waals interaction is replaced with resonant dipole-dipole interactions – this makes them interact much more strongly than before, and at longer distances. Blockade was caused by the atoms within a polariton interacting – but now the polaritons interact with each other. We see that at low microwave powers, these interactions completely prevent the stored photons being retrieved, scattering them out of the cloud in other directions. But stronger microwaves can overwhelm the dipole-dipole interactions, and we see oscillations again. 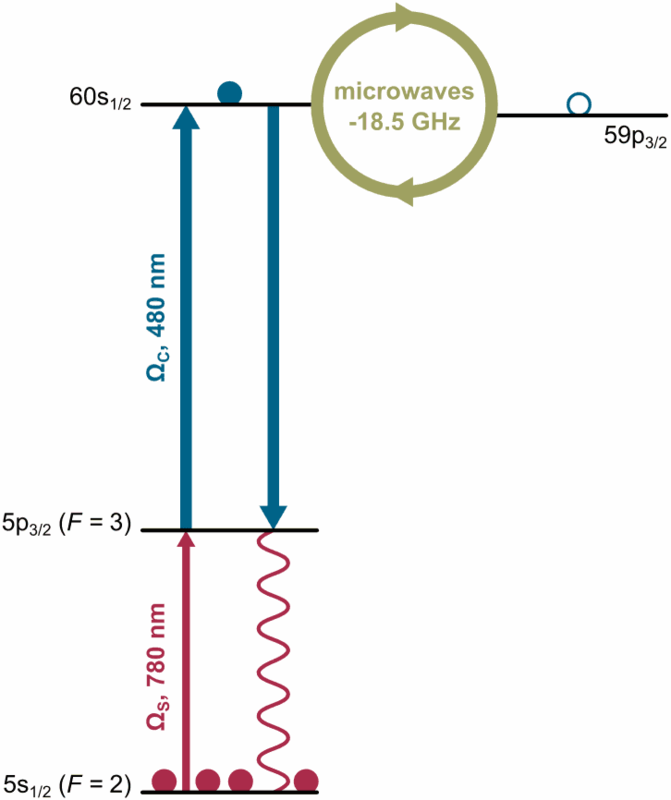 Figure 3: The microwave-induced Rabi oscillations between two Rydberg states. Microwave power increases from left to right. The dashed line shows the transition from low power (dominated by Rydberg-Rydberg interactions) to high power (dominated by the microwaves). This is a subtle system, and not yet fully understood. There is plenty more experimental and theoretical work to do. But we can already imagine applications. By controlling strong interactions between individual photons, it may be possible to build quantum logic gates that could be used in super-fast quantum computers, or super-secure quantum cryptography. There are also similarities between the way that specific Rydberg states can “hop” between polaritons, and the hopping of excitations along light harvesting complexes in plants. Experiments like these may help model photosynthesis, perhaps even helping scientists design more efficient solar cells. D. Maxwell, D. J. Szwer, D. Paredes-Barato, H. Busche, J. D. Pritchard, A. Gauguet, K. J. Weatherill, M. P. A. Jones, C. S. Adams, "Storage and Control of Optical Photons Using Rydberg Polaritons". Physical Review Letters , 110, 103001 (2013). Abstract. Antoine Browaeys, "Viewpoint: Catch and Release of Photons". Physics , 6, 25 (2013). Article. Thibault Peyronel, Ofer Firstenberg, Qi-Yu Liang, Sebastian Hofferberth, Alexey V. Gorshkov, Thomas Pohl, Mikhail D. Lukin, Vladan Vuletić, "Quantum nonlinear optics with single photons enabled by strongly interacting atoms". Nature, 488, 57-60 (2012). Abstract. Y.O. Dudin, A. Kuzmich, "Strongly Interacting Rydberg Excitations of a Cold Atomic Gas. Science". 336, 887-889 (2012). Abstract. Alexios Beveratos, Rosa Brouri, Thierry Gacoin, André Villing, Jean-Philippe Poizat, and Philippe Grangier, "Single Photon Quantum Cryptography". Physical Review Letters, 89, 187901 (2002). Abstract. Michel Orrit, "Photon Statistics in Single Molecule Experiments". Single Molecules, 3, 255-265 (2002). Abstract. R. Hanbury Brown, R.Q. Twiss, "Correlation between Photons in two Coherent Beams of Light". Nature, 177, 27-29 (1956). Abstract.